The beauty of a labyrinth is that you can't get lost. It's one path in and out. It twists and turns improbably, but as long as you stay on it, you'll find your way. A maze is not the same as a labyrinth, although people often mix them up. A maze has multiple paths, with dead ends, and finding the center is a hard-earned reward, not a given. A maze is a puzzle and engages your brain in a different way than a labyrinth. Because you don't have to find your way, when you walk a labyrinth you can let your mind go, and enter a form of walking meditation. Some people find it highly spiritual, and others just think it's a relaxing and calming way to take a walk. 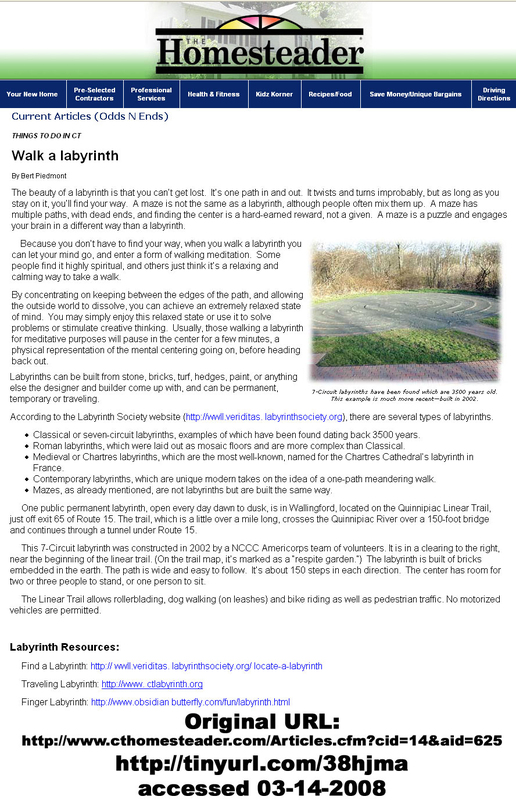 According to the Labyrinth Society website, there are several types of labyrinths. Classical or seven-circuit labyrinths, examples of which have been found dating back 3500 years. Roman labyrinths, which were laid out as mosaic floors and are more complex than Classical. Medieval or Chartres labyrinths, which are the most well-known, named for the Chartres Cathedral's labyrinth in France. Contemporary labyrinths, which are unique modern takes on the idea of a one-path meandering walk. Mazes, as already mentioned, are not labyrinths but are built the same way. By concentrating on keeping between the edges of the path, and allowing the outside world to dissolve, you can achieve an extremely relaxed state of mind. You may simply enjoy this relaxed state or use it to solve problems or stimulate creative thinking. Usually, those walking a labyrinth for meditative purposes will pause in the center for a few minutes, a physical representation of the mental centering going on, before heading back out. Labyrinths can be built from stone, bricks, turf, hedges, paint, or anything else the designer and builder come up with, and can be permanent, temporary or traveling. One public permanent labyrinth, open every day dawn to dusk, is in Wallingford, located on the Quinnipiac Linear Trail, just off exit 65 of Route 15. The trail, which is a little over a mile long, crosses the Quinnipiac River over a 150-foot bridge and continues through a tunnel under Route 15. This 7-Circuit labyrinth was constructed in 2002 by a NCCC Americorps team of volunteers. It is in a clearing to the right, near the beginning of the linear trail. (On the trail map, it's marked as a "respite garden") The labyrinth is built of bricks embedded in the earth. The path is wide and easy to follow. It's about 150 steps in each direction. The center has room for two or three people to stand, or one person to sit. The Linear Trail allows rollerblading, dog walking (on leashes) and bike riding as well as pedestrian traffic. No motorized vehicles are permitted. (c)2007. Some information may be out of date. To complete a labyrinth without leaving your house, visit my Finger Labyrinth!